The exestence of antimatter was theoretically predicted by Paul Dirac in 1929. Soon afterwards Carl Anderson observed in cosmic rays the first antiparticles, whose electric charge is of opposite sign and all other properties are the same as for the particles. One of the great mysteries of physics is that we cannot see antimatter galaxies in the observed part of the Universe, after the Big Bang a tiny little more particles were produced than antiparticles, and thus - in spite of the a very basic theorem of particle theory - their properties might be slightly different. CERN, the European Particle Physics Laboratory has built its Antiproton Decelerator (AD) in order to test the matter-antimatter symmetry. 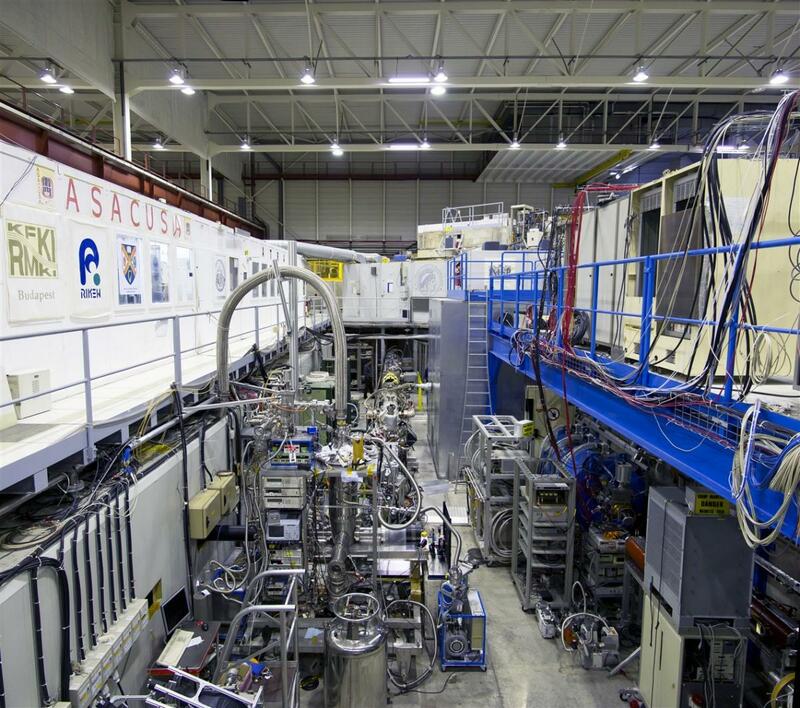 This year a great success of the ALPHA experiment of the AD was keeping antihydrogen atoms, the bound states of antiprotons and positrons, in an electromagnetic trap for long enough time, which should be later sufficient for spectroscopic studies of high precision. Extreme Low ENergy Antiprotons) in order to increase the antiproton trapping capacity of the AD, the new apparatus is planned to start in 2016. Figure 1. The ASACUSA experiment. Antiprotons from the AD (upper right) via the radiofrequency post-decelerator and a bending magnetic beam guide enter the helium gas of low temperature and pressure and get captured in long-lived atomic orbits. 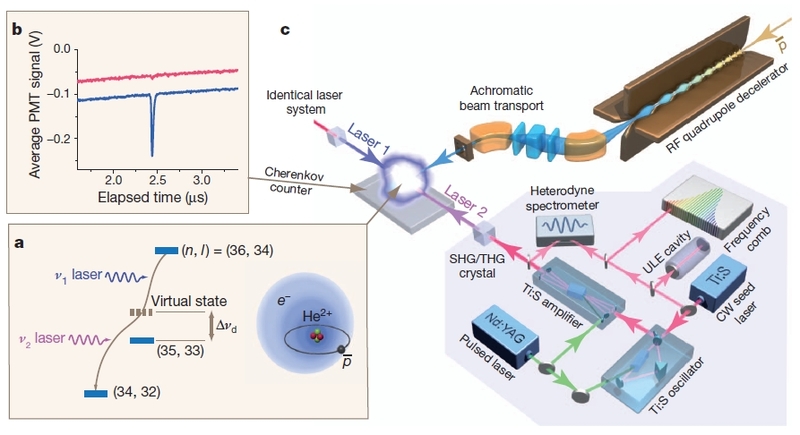 Using lasers of extraordinarily precise tuning from two sides we irradiate the metastabel antiprotonic helium atoms and search resonant transitions to short-lived states where they immediately annihilate, what we detect with Cherenkov counters (upper left). The laser frquency at the moment of annihilation correspond to the energy of the antiproton transition which allows us to determine the ratio of the antiproton and electron masses with the help of precise theoretical calculations. with two short films of the ASACUSA experiment and of an interview with Masaki Hori (Max-Planck Institute for Quantum Optics, Munich, and University of Tokyo), the leader of the experiment. In the films we can see two Hungarian physicists, Dániel Barna and Anna Sótér.